Wikid GRRLs was started by the enthusiasm and incredible energy, as well as vision, of my friend and colleague Stine Eckert. To learn more about how it all began, and how she managed the team of five teachers throughout the project, see the piece adjacent to this one. As one of the teachers of the Wikid GRRLs project, I will describe my experience. The only one with a car, the team assigned me to the school farthest from our campus: the Barrie School in Silver Spring, MD. This school is also an official partner of the Future of Information Alliance (FIA) at UMCP, who supplied the seed grant for Wikid GRRLs. Of all the schools in which we taught during the brief period allotted to implement our project (February to May), the Barrie School had the best resources and the most dedicated staff. I met with my girls nine times, and it was overall an edifying, even if at times exasperating, experience. For the first time during my graduate studies I participated in a project which takes good ideas from academe into the “real world,” to test them as potential solutions to real problems. On the first day, I met with my group of eight girls. We discussed why so few girls contribute to a big knowledge source such as Wikipedia. Most girls shrugged their shoulders, not really having considered this question before. But one response stuck with me: “Well, we have better things to do. We have to take care of our families.” If until that day I had been on board with Wikid GRRLs mentally, as of that moment, I resolved with the full force of my will to carry it out as best I could. It is precisely this sort of thinking, which we hear a lot of from girls – even at this young age of 13-15 years – that unfortunately biases the online knowledge-sharing experience towards men’s points of view. It isn’t that girls think they are “not smart enough” or “not good” at technology. In most cases they are reluctant because they hold a deeply ingrained conviction that girls have “other” primary responsibilities – that is, caring for their loved ones. The idea that this responsibility should weigh even an ounce more on girls (and women) than it does on boys (and men) is at best unfounded and at worst rather unsettling. Across the four schools where Wikid GRRLs operated for ten weeks, we gave about 40 girls access to a private Wiki site where they posted their own articles. We taught them how to create, structure, edit, format and visually enhance these articles. We asked them to think about content first, emphasizing the need for neutrality and proper sourcing as well as a clear and comprehensive structure. We also introduced the girls to various tools which could improve their articles: Google Trends to source the popularity of a key word, Poll Everywhere to gather public opinion on any topic (albeit on a micro scale), YouTube and Google Maps to embed videos and maps into their articles, and Creative Commons to include images which are free to use. 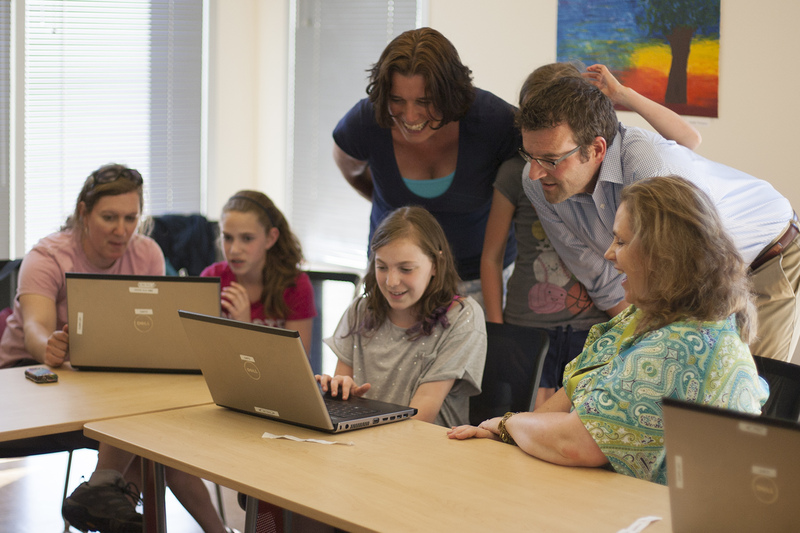 The girls learned that while the internet they have been nursed with from their earliest years is a great tool for interpersonal communication and discovering “cool” facts, it is also a place where they can generate new ideas, share their knowledge, and thus contribute something of themselves to the internet community. In sum, although the project was very tightly scheduled, not allowing us to go into as much in depth as we would have wanted to, I saw enthusiasm and fun glistening in the girls’ eyes as they saw their content build up from a bare skeleton to a complete source of information on, for example, a future career they might like to embrace (doctor? lawyer? basketball player?). We also have benefitted from and have been encouraged by similar projects, which help girls to get “into” technology and computers such as “Girls Who Code” or the CyberSTEM Camp and Computer Science Connect initiatives here at UMD. The more these kinds of programs develop, the higher the chance that we can convey to every girl this crucial fact: there’s no reason for a girl to give higher priority to care for immediate others to the detriment of sharing her wisdom and skill with a wider public compared with boys. I have never labeled myself a “feminist,” but that day when one of my students gave her reason for not contributing to our common human wisdom, I think I became one. *Joanna Nurmis is completing her doctoral work in the UMCP Philip Merrill College of Journalism. This entry was posted in Features and tagged education, gender, girls, online, Technology, Wikid GRRLS, Wikipedia. Bookmark the permalink.